From indigenous to downright metaphysical! independently fell under the creative spell of the island of Bali and set up studios there — JP from '74 and Jon from '89. Years later in Hawaii, JP started building guitars and asked Jon to contribute his expertise ... ultimately resulting in the extravagance you see above. Thomas is the guitarist, guitar builder, and Anderson is the master of Polymer Clay art which becomes the finish on many Hand guitars. The initial process derives from the classic Venetian Millefiori glass making techniques applied to polymer clay. 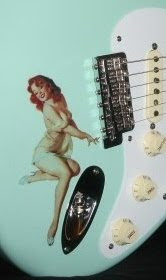 How the clay is applied and finished on a guitar is mostly proprietary. I should also mention that JP Thomas is a killer slide player with a pretty good grasp of the Sonny Landreth behind-the-bar-style. You absolutely must visit their website and check out the About page as well as everything else. These guys also make finishes out of coconut shell and other stuff. Absolutely stunning finishes at that! 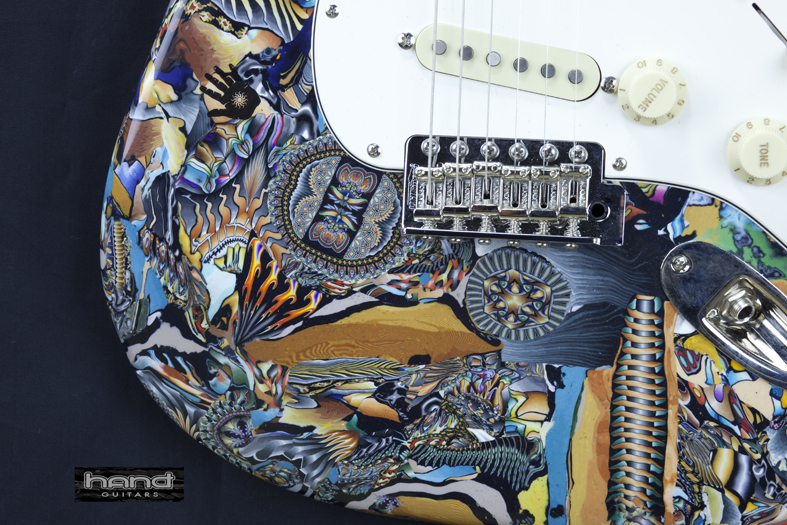 As for the guitars themselves, Thomas is fond of classic designs, implementing hi-end woods, hardware & electronics. Hand Guitars made an official debut at NAMM of Summer 2010, and have already shown up in Guitar Player & Premier Guitar mags. Please check the video links below for more on the Polymer Clay process and a good product overview from NAMM by PG. Polymer Clay Video - Slammin' soundtrack too!